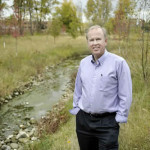 Lockheed Martin Corp., the Land Conservancy and a host of other partners have transformed a polluted ditch into beautifully restored stream and greenway in southeast Akron. 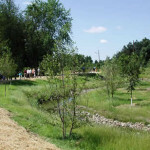 The new Haley’s Run trail and wetlands area, which was officially dedicated on June 30, is the result of a year-long stream remediation project by Lockheed Martin. 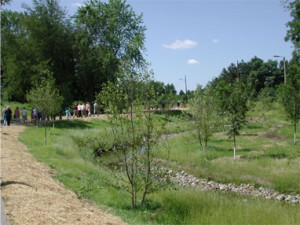 More than 100 people, including Akron Mayor Don Plusequellic, project officials, other local dignitaries and neighborhood residents, celebrated the opening of the scenic walking trail and restored natural creek. The Land Conservancy, which plans to enhance the greenway with similar work along nearby Adam’s Run, helped Lockheed Martin secure properties needed for the Haley’s Run project. Lockheed Martin first completed a voluntary environmental cleanup of the stream, which contained PCBs carried in rainwater from the nearby Airdock, which was built by Goodyear-Zeppelin Corp. in 1929. Lockheed Martin owned the Airdock when the PCBs were discovered. The Land Conservancy plans to create a similar greenway along Adam’s Run to the point where it connects with Haley’s Run and then north to the Little Cuyahoga River. Eventually, residents will be able to take this trail system to the Ohio & Erie Canal Towpath Trail. 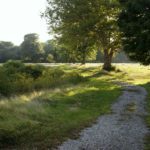 The Land Conservancy now owns about 2.5 acres along Adam’s Run and has been awarded a $10,000 grant from Mary S. and David C. Corbin Foundation for additional greenway work there.